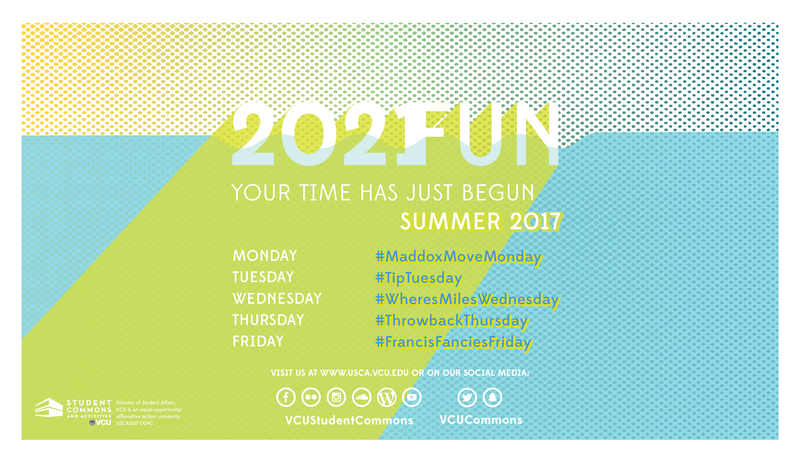 During the months of June, July and August, USC&A will be releasing daily content to prepare the Class of 2021 for their first semester at VCU! Maddox on the Move is a video series about the multiple USC&A buildings, their services and resources. We will also feature some of our campus partners! Videos will be posted on our YouTube channel (VCUStudentCommons). On Tuesdays, we will share helpful tips to make your experience at VCU easier and more enjoyable. Miles in his Shoes is a video series that will showcase some of Richmond’s fun activities offered off campus that new students may not know about. Videos will be posted on our YouTube channel (VCUStudentCommons). Previous USC&A articles, pictures and videos from past semesters that have content relevant to the Class of 2021 will be shared on Thursdays. Francis Fancies Food is a video series that aims to show students how simple and delicious cooking with minimal or cheap ingredients can be. Videos will be posted on our YouTube channel (VCUStudentCommons). Check back here for new content everyday! Also, we will be posting updates on our Twitter (@VCUCommons), Facebook and Instagram (@VCUStudentCommons) profiles.